The Inline Planet is pleased to announce the latest addition to the NROC race series — the Badger State Inline Marathon in the Wisconsin Dells. The event (June 29) is part of the American Family Insurance-Badger State Games, a multi-sport festival modeled after the Olympics and run by the Wisconsin Sports Development Corporation. The nonprofit runs a high-quality marathon, complete with chip-timing and an out-and-back racecourse through the sylvan landscape of Portage, WI. The course includes a few gradual climbs but is mostly flat. Its turnaround consists of a loop of several miles, thereby eliminating the need for a sharp and potentially dangerous transition. The event provides skaters and their families with an excellent vacation opportunity. The Wisconsin Dells are one of the Midwest's top tourist destinations and are world-renowned for their scenic beauty, resorts, waterparks, fishing and hunting. The region takes its name from a spectacular sandstone gorge on the Wisconsin River. The Badger State Games are part of the National Congress of State Games, an organization committed to the promotion of grassroots competition and the lifelong success of athletes. The Badger Games include more than 30 different events — from archery to wrestling. Most are for Wisconsin residents only. But the inline full and half marathons are open to everyone. The goal of the National Roller Cup is to bring a new layer of excitement to inline racing in 2008. Organized by the Inline Planet, the series will rank skaters using two separate systems: one for pros, the other for non-pros (recreational and fitness skaters). The pro system will assign points based on order of finish in several categories. The non-pro system (NROC Prime) will provide performance scores to all marathon participants. 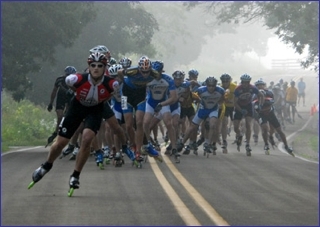 The Badger State Inline Marathon is the sixth event to join NROC. The NorthShore Board of Directors is expected to consider joining NROC next week. Go to Badger State web site.